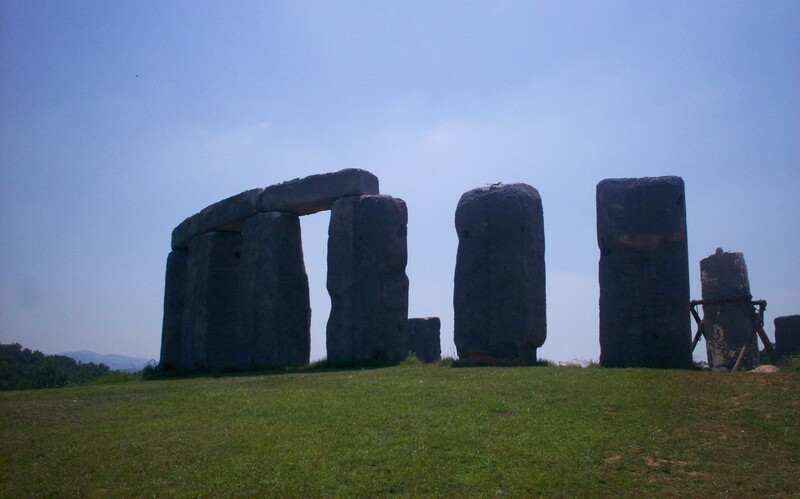 Our 2008 Road Trip, Part 13: Seven Wonders on the Way Back « Midlife Crisis Crossover! KING KONG SMASH PUNY PLANES! IF PLANES WOULD DO KONG FAVOR AND FLY CLOSER TO GROUND! KONG NOT HAVE SKYSCRAPER HANDY! 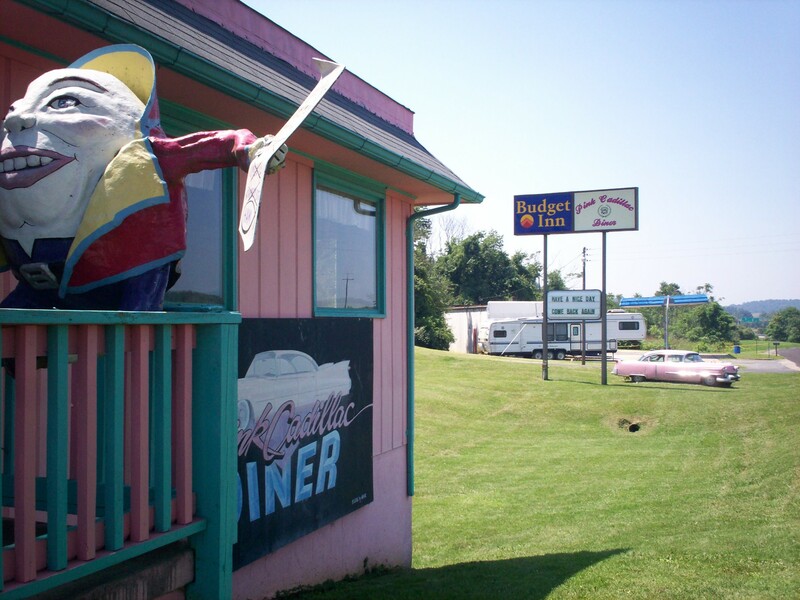 Roadside attractions are naturally part of our road-tripping experience. We won’t necessarily drive fifteen miles out of our way to see a Paul Bunyan statue in an area that has absolutely nothing else of interest, but if one just so happens to be standing across the street from a Presidential burial site, we might make time for a cheesy cameo along the way. We’re more susceptible to oddball sights when we’re on our way home, have hours to kill, and need our monotony broken up. In the case of our westward trek across Virginia, monotony wouldn’t be a problem for long. 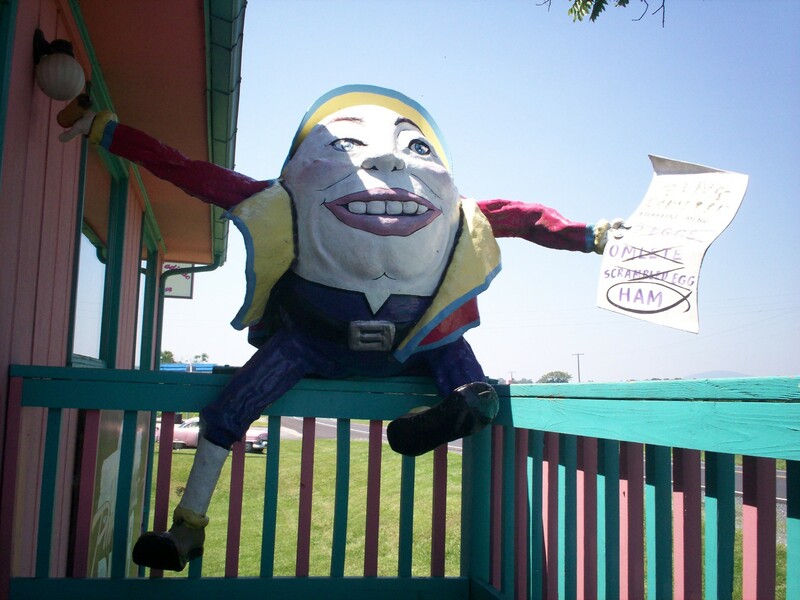 Humpty Dumpty sat on a porch / Humpty Dumpty felt the sun scorch / All the king’s people — every gent, every ma’am / Didn’t ask what Humpty wanted with ham. The morning of Day Six, we waved goodbye to the Hampton Roads area with one last celebratory breakfast at Dunkin Donuts, just in case we never saw it again. The restaurant, I mean, not the area. We felt no rush to return to the area anytime within the next thirty years unless one of us becomes a flash-in-the-pan celebrity someday and some undiscerning promoter pays our way to sign autographs at some weird, sad convention there. Our next several hours were spent retracing I-64 through Virginia’s miles-long wall-of-trees sameness until we reached the town of Natural Bridge. Lunch was planned for the Pink Cadillac Diner, a cozy kitsch explosion in a classic restaurant shape. Sure, we could’ve gotten a closer shot of the titular pink Cadillac, but those footsteps would’ve taken us farther away from lunch. The walls were covered with the sort of old photos, movie posters, LP cover art, cowboy memorabilia (including Red Ryder! 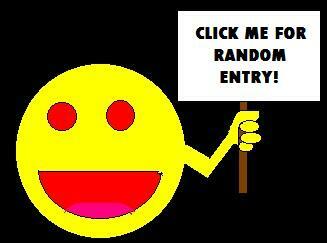 ), found objects, and random ’50s comic books that would fetch hundreds on eBay if they were in Mint condition. Predictably they had a copy of the poster from the Clint Eastwood/Bernadette Peters vehicle Pink Cadillac. One doorway was flanked on either side by cardboard standees of Archie Andrews and his best friend Jughead. Their booth cushions felt as if they were stuffed with doorknobs and nightsticks and caused my muscle strain to flare up through our entire visit. Just for the sake of having something else pointless and silly to include in our memoirs, I ordered the Elvis Burger, which amounted to their version of the Big Mac, except the cook swapped the heel and the club in error. Our waitress was friendly and chatty and I forgive her for the complete lack of refills. I can only hope — when she brought up her family issues with us at length — that we were able to provide some small comfort. After our unplanned regrettable stop at the Natural Bridge Zoo, down the road in the same town of Natural Bridge was another semi-unique feature: Foamhenge! Holy site to Nerf druids worldwide. It’s basically what it sounds like. That’s the refinished part of it at the time of our visit. We’d read online that it was closed for the summer for reconstruction, but we saw no signs discouraging visitors. We parked in the grass at the foot of an offroad tall hill and strolled to the top, where workers off to our right were busy sculpting and sanding chunks of replacement Styrofoam, no doubt just the way the ancient Celts did. What we saw was renovation in progress rather than the full, real, imitative deal. 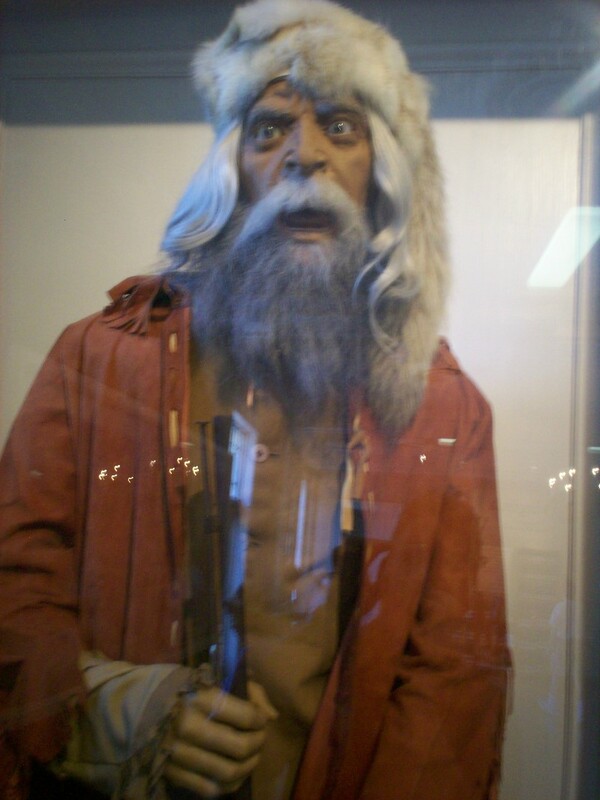 Grizzled psycho woodsman, hopefully a statue and not possessed taxidermy. 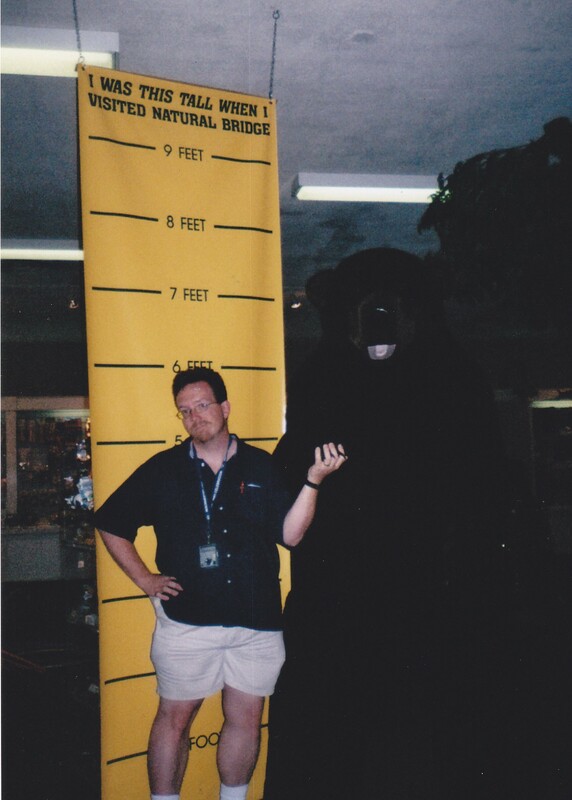 How tall are you next to this bear that could maul you if it were real? Alternatively, how high would you have to get to stand next to that sort of bear? Like a raptor cowboy! / Riding out like a fool who’s a big pile of dino chow! Their harshest sentry by far would be the cashiers and their arsenal of evil ticket prices. 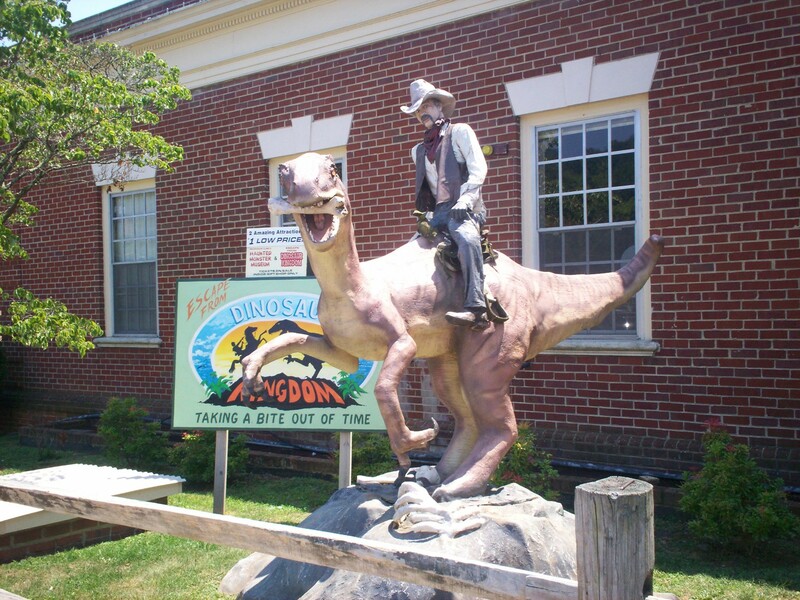 We could visit the Natural Bridge and nothing else, or we could buy package deals that included admission to other local sites such as the Natural Bridge Wax Museum, the Natural Bridge Toy Museum, the Natural Bridge Monster Museum, Dino Kingdom, and less, less, less. As exhausted as we were from our long, uncomfortable week, we decided a visit to the Natural Bridge itself would do, and we agreed that skipping the rest in favor of more interstate monotony was an acceptable compromise. To be continued! Next time: that bridge! 1. 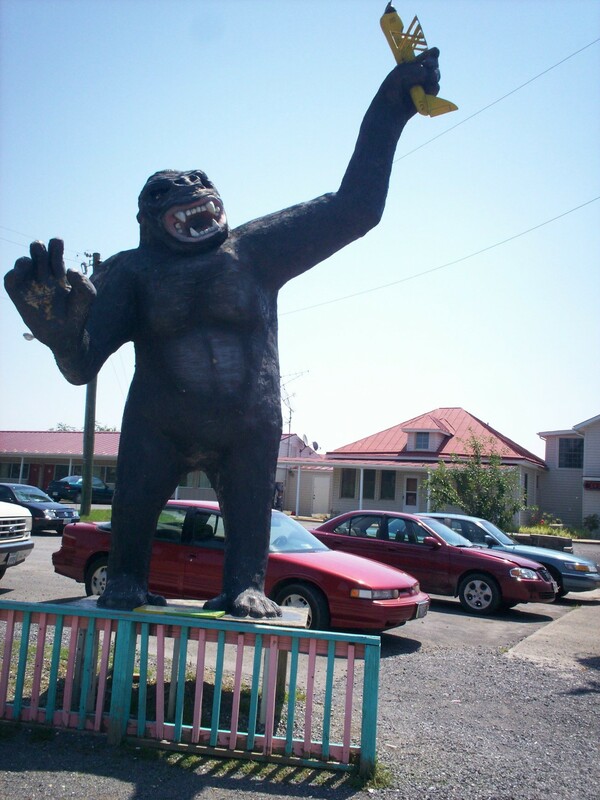 Kong and Humpty, both the work of a sculptor named Mark Cline, were removed from the Pink Cadillac a few years later and relocated to another local attraction that featured his work more prominently. Presumably the pink Cadillac and TGIFriday’s decor stayed put. 2. The Natural Bridge area became Natural Bridge State Park in 2016. Under new management by the Commonwealth of Virginia, admission prices were slashed drastically. Of the remaining attractions that we refused to overpay for: Dinosaur Kingdom burned down in 2012; the Natural Bridge Toy Museum was less destructively shuttered that same year; and the Natural Bridge Wax Museum closed in November 2014 as a direct consequence of the government takeover. 3. Foamhenge was likewise dismantled but, due to popular demand, lives on today. All pieces were relocated and reassembled some 170 miles northwest at a place called Cox Farms, where its grand reopening was held in September 2017. That is awesome. Thanks so much for letting me know!